As the new chair of the Senate Foreign Relations Committee, Republican Sen. James Risch said he will “work with the president” and resolve any differences “personally” — a sharp contrast to the approach taken by his predecessor, former Sen. Bob Corker, R-Tenn., who often sparred with President Donald Trump. 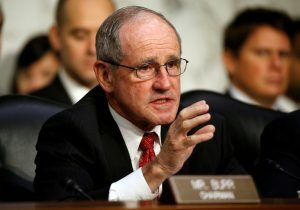 Risch defended Trump’s rhetoric on Russia, called China a “larger concern,” and criticized Iran. On China: Risch criticized China for what he described as predatory trade practices. He pointed to reporting thatChinese nationals infiltrated Micron Technology, the world’s second-largest producer of memory chips based in his home state of Idaho. “This kind of thing can’t go on,” he said. Was U.S. condemnation of Jamal Khashoggi’s murder enough? “There’s going to be a robust oversight of what Saudi Arabia does itself to hold the people accountable inside,” Risch said. A plug for Idaho. Asked why he was interested in the chairmanship, Risch said that Idahoans were “as engaged as anyone” on American foreign policy. “We in Idaho are producers,” whether it’s in agriculture, technology or another industry, he said. “We realize that 95 percent of our customers live outside the borders of the United States. It is incredibly important to us” that we have good relations with other countries.